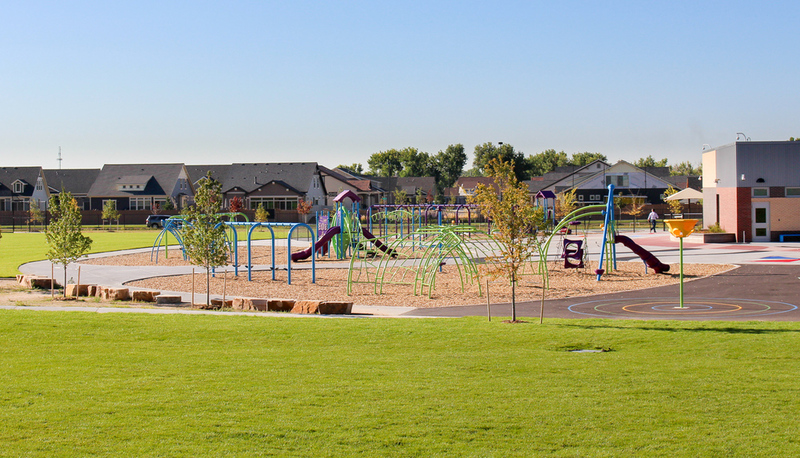 Lafayette, Colorado...September 16, 2014 - Design Concepts, an award-winning community and landscape architecture firm, announced today the ribbon-cutting celebration marking the opening of a new Learning Landscape at Frances Jacobs School. The school, with grades from early childhood education through fifth grade (ECE-5), is a new Denver Public School located in the Green Valley Ranch neighborhood. The theme was developed through an interactive process with the architect. “Energy themes integrate with the outdoor environment and common elements blend between the building and the landscape,” states Henry. Multiple forms of energy, including wind, corn, geothermal, petroleum, sun, nuclear, coal and hydro power are expressed in graphic images throughout the site, and inspirational quotes etched into the outdoor amphitheater follow this theme. A variety of energy-infused interactive learning amenities include an interactive sun clock, windmill hopscotch, foursquare, basketball court with graphic expressions for centrifugal force, the path of inertia, tetherball courts painted like propellers, a wind pattern maze, and whimsical items like a dandelion’s seeds blowing in the breeze scattering triangles across the play pads are etched or painted on hard surfaces. 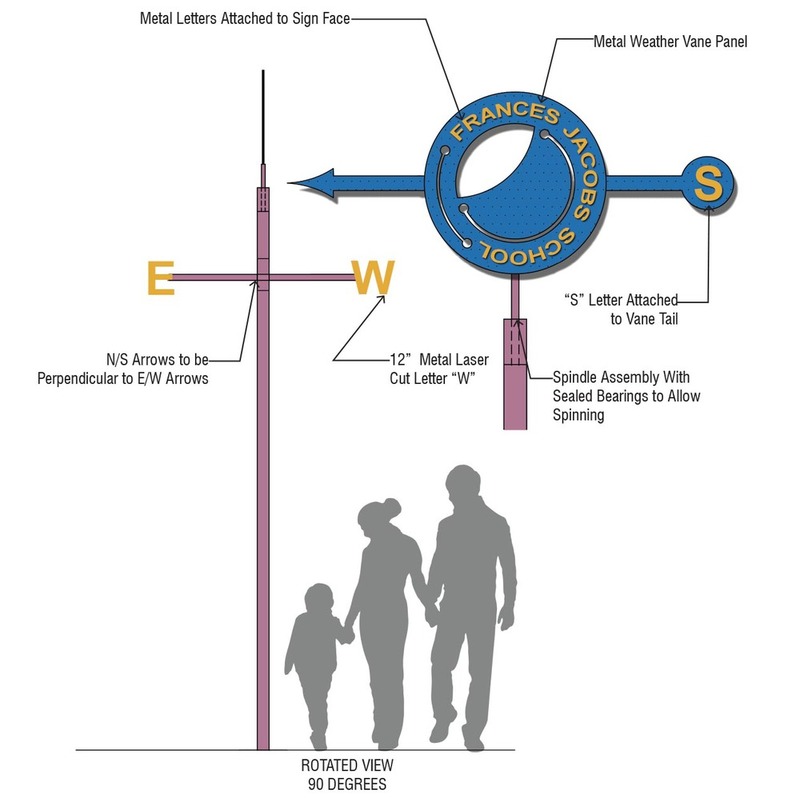 The site design also includes common amenities appropriate to a school site including outdoor recreation and play fields, open spaces and plazas to welcome and embrace the community, along with carefully planned parking and student drop-off and pick-up zones for both parent and bus access. The design not only provides maximum functional site organization and amenities, but also offers a fun and healthy active learning environment for students, teachers, parents and the surrounding community. Design Concepts is regarded as a leader in the forefront of planning and design of Learning Landscapes. The firm has completed over 30 full and partial Learning Landscapes and over 400 schools including most recently, the just opened Conservatory Green Middle School and High Tech Elementary School for Denver Public Schools. Other current projects include the new Elbert K-12, Englewood High School Campus, Prairie Heights Middle School in Evans, and a new K-8 for Aurora Public Schools.